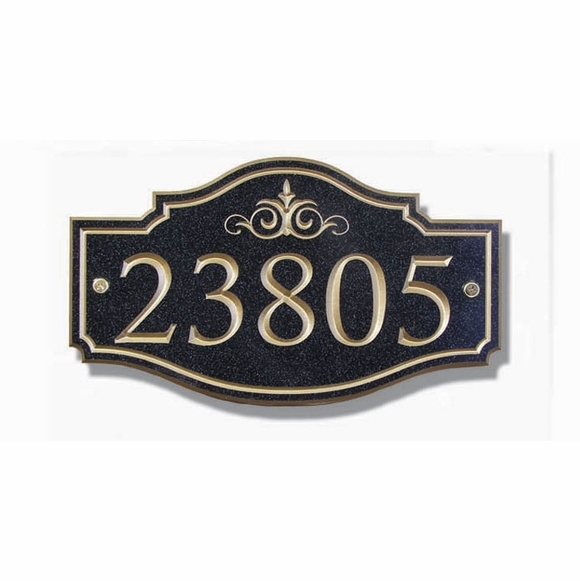 Victorian House Number Wall Plaque elegantly displays your home address. Made of a stone-like resin known as avonite, this personalized address plaque holds up to five large numbers. Wall mount with the included gold screws. Signs are carved with a classic deep "V" groove and painted with exterior acrylic enamel. UV properties of avonite allow the material to withstand outdoor weather conditions. Two sizes: 8" x 14" and 10" x 16". Avonite plaques come in three textured colors - - casablanca (off white), lagoon blue, and night shadow black plaques - - and in six imprint colors. Imprint colors barn red, essex green, light navy, or black are for use on casablanca plaques. Please type the text you desire and select your size, plaque color, and imprint color in the appropriate boxes above. Personalized and custom made just for you.